Technical data: Rated power input - 850 W Max. impact energy	- 3.2 J Impact rate at rated speed ..
Power Input - 1300W No Load Speed - 450rpm Blow Energy - 8.5 Full Load Hammer Action - 2840 bpm .. The most Powerful Hammer in its Class Thanks to its Powerful 1350 Watt Motor Highest Material Remo.. 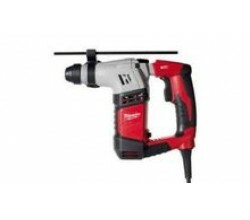 Pistol form SDS Plus Fixing Hammer The Ideal Hammer for Smaller Anchor Holes and Through Holes up t..
20mm SDS Plus 2 Mode L-Shaped Fixing Hammer Power Input - 620W Blow Energy - 2J Full Load Hamme.. Rated power input 650 W Max. impact energy 1,7 J Impact rate at rated speed - 0-4980 bpm Rated..
Watts = 700 Input Voltage = 110 Volts Chuck = SDS Plus Capicity = 24mm Concrete,13mm Steel Weigh..
Watts = 720 Input Voltage = 110 Volt Chuck = SDS Plus Capacity = 24mm..
Watts = 550 Chuck = SDS Plus Rpm = 0 - 5500 Capacity = 20mm Concrete , 13mm Steel..
26mm SDS Plus 3 Mode Hammer Power Input - 725W Blow Energy - 2.4J Full Load Hammer Action - 0-4..